Heidi E. Pass is in her 2nd year of PhD candidature at the Centre for Excellence in Ore Deposits (CODES) at the University of Tasmania studying carbonate and sulfide zonation patterns in alkalic porphyry and epithermal mineral systems. Ms. Pass graduated with distinction from the University of Victoria (Hons. B.Sc.) in 2000. She worked in the environmental consulting industry as a Project Hydrogeologist and Environmental Geoscientist for 4.5 years. Projects sites ranged from industrial contaminated sites to ARD/ML assessments of closing and abandoned mine sites across western and northern Canada. Ms. Pass has a diverse background from her many experiences ranging from applied chemical research to marine and petroleum geology. Prior to undertaking her postgraduate studies in economic geology, Ms. Pass was employed as a contract geologist in greenfields exploration for diamond and base metal deposits. She is a past president of the CODES postgraduate society and is on track to complete her PhD studies late in 2008. The principal objective of this PhD project (Carbonate and Sulphide Zonation Patterns in Alkalic Porphyry and Epithermal Mineral Systems — Implications for Ore Genesis and Mineral Exploration) is to investigate the geochemistry of carbonate- and sulfide-bearing veins and breccia infill within and around two alkalic deposits. The North East Zone (NEZ) of the Mt. Polley Cu-Au porphyry deposit in central BC accounts for approximately two-thirds of the total PhD project. The NEZ has higher Cu-grades, higher bornite content, higher Cu:Au, higher Ag, and lower magnetite content than other breccia-hosted deposits in the district, and demonstrates district scale zoning that may reflect depth of emplacement. The second deposit of this study, Barrick Gold Corporation’s Cowal epithermal gold deposit in New South Wales (NSW), Australia provides the opportunity to compare and contrast the findings of work conducted at Mt. Polley. The Cowal Au deposit is suspected to be an alkalic epithermal deposit and as yet is the only such system known in the alkalic districts of BC and NSW. Information collected from these two sites will be used to evaluate the following: What are the sources and compositions of mineralising fluids for alkalic porphyry and epithermal deposits? ; What are the principal ore forming processes? 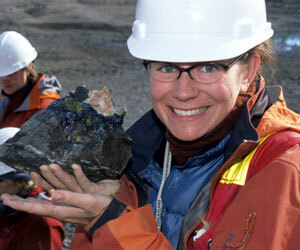 ; What are the genetic links between the alkalic porphyry and epithermal environments? ; and What exploration vectors can be determined from the geological and geochemical features of these mineral deposits? This thesis provides the first detailed analysis of carbonate mineral chemistry in porphyry systems and the first detailed carbonate mineral zonation study of alkalic mineral systems. This PhD is one of several studies being conducted under the Shallow and deep-level alkalic mineral deposits: Developing an integrated exploration model.